Here’s a quick post to describe an issue I didn’t see referenced anywhere else except for within forum replies. A customer had Windows Server 2012 R2 Essentials configured with Office 365 Integration but noticed they were unable to make any changes to the integration (such as changing the Admin account or adding new users) and the Exchange Online-related status indicators in the Essentials Dashboard were not being displayed properly. The customer stated this issue happened once before but apparently resolved itself. However, in this case, functionality had been broken for several weeks before they decided to reach out to me. I first looked under the C:\ProgramData\Microsoft\Windows Server\Logs folder within the SharedServiceHost-EmailProviderServiceConfig.log file for any Integration Tool errors. I was able to trace the error message to this Microsoft forum post where MVP Susan Bradley provided the resolution. In this case, the resolution was to navigate to the HKEY_LOCAL_MACHINE\SOFTWARE\Microsoft\Windows Server\Productivity\O365Integration\Settings registry key and delete or rename the “BecEndPointAddress” registry entry. This entry had a value of the application server referenced in the error message above (bws902-relay.microsoftonline.com). After restarting all the Windows Server Essentials services, O365 Integration was fully restored. My theory as to why this occurred is the application server the key referenced became inaccessible for some reason. I would think this value should be a load balanced name and not an individual server name. In a Lync and Exchange UM environment (version doesn’t particularly matter in this case), voicemail messages were not being delivered. The voicemail folder on Exchange (C:\Program Files\Microsoft\Exchange Server\V15\UnifiedMessaging\voicemail) was filling up with hundreds of .txt (header files) and .wav (voicemail audio files). This issue is not necessarily new (Reference1 Reference2), but it didn’t immediately come up in search results. I also wanted to spend more time discussing why this issue happened and why it’s important to understand receive connector scoping. This issue was caused by incorrectly modifying a receive connector on Exchange. Specifically, a custom connector used for application relay was modified so instead of only the individual IP addresses needed for relay (EX: Printers/Copiers/Scanners/3rd Party Applications requiring relay), the entire IP subnet was included in the Remote IP Ranges scoping. This ultimately meant that instead of Lync/ExchangeUM using the default receive connectors (which have the required “Exchange Server Authentication” enabled), they instead were using the custom application relay connector (which did not have Exchange Server Authentication enabled). 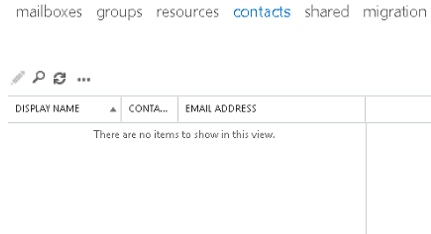 The Microsoft Exchange Unified Messaging service on the Mailbox server encountered an error while trying to process the message with header file “C:\Program Files\Microsoft\Exchange Server\V15\UnifiedMessaging\voicemail\<string>.txt”. 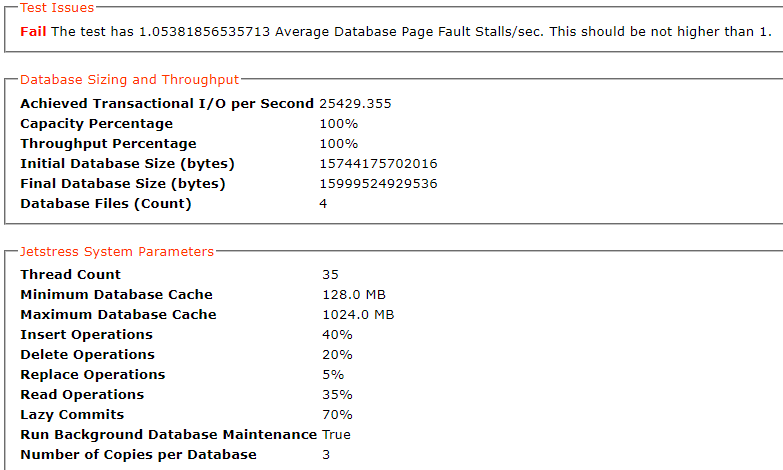 The message will be deleted and the “MSExchangeUMAvailability: % of Messages Successfully Processed Over the Last Hour” performance counter will be decreased. Error details: “Microsoft.Exchange.UM.UMCore.ReachMaxProcessedTimesException: This message has reached the maximum processed count, “6”. Unfortunately, once you see this message above (EventID 1335) the message cannot be recovered. When UM states the message will be deleted, it will in fact be deleted with no chance of recovery. If the issue had been going on for several days and this folder were part of your daily backup sets then you could technically restore the files and paste them into the current directory; where they would be processed. However, if you did not have a backup then these voicemails would be permanently lost. Note: Certain failed voicemail messages can be found in the “C:\Program Files\Microsoft\Exchange Server\V15\UnifiedMessaging\badvoicemail” directory. However, as our failure was a permanent failure related to Transport, they did not get moved to the badvoicemail directory and instead were permanently deleted. I wanted to further explain how this issue happened, and hopefully clear up confusion around receive connector scoping. In our scenario, someone left a voicemail for an Exchange UM-enabled mailbox which was received and processed by Exchange. The header and audio files for this voicemail message were temporarily stored in the “C:\Program Files\Microsoft\Exchange Server\V15\UnifiedMessaging\voicemail” directory on the Exchange UM server. Our scenario involved Exchange 2013, but the same general logic would apply to Exchange 2007/2010/2016. UM would normally submit these voicemail messages to transport using one of the default Receive Connectors which would have “Exchange Server Authentication” enabled. These messages would then be delivered to the destination mailbox. Our failure was a result of the UM services being directed to a Receive Connector which did not have the necessary authentication enabled on it (the custom relay connector which only had Anonymous authentication enabled). Under normal circumstances, this issue would probably be detected within a few hours (as users began complaining of not receiving voicemails) but in our case the change was made before the holidays and was not detected until this week (another reason to avoid IT changes before a long holiday). This resulted in the permanent Event 1335 failure noted above and the loss of the voicemail. Since this failure occurs before reaching transport, Safety Net will not be any help. So let’s turn our focus to Receive Connector scoping, and specifically, defining the RemoteIPRange parameter. Remote IP Ranges define for which incoming IP address/addresses that connector is responsible for handling. Depending on the local listening port, local listening IP address, & RemoteIPRange configuration of each Receive Connector, the Microsoft Exchange Frontend Transport Service and Microsoft Exchange Transport Service will route incoming connections to the correct Receive Connector. The chosen connector then handles the connection accordingly, based on the connector’s configured authentication methods, permission groups, etc. A Receive Connector must have a unique combination of local listening port, local listening IP address, and Remote IP Address (RemoteIPRange) configuration. This means you can have multiple Receive Connectors with the same listening IP address and port (25 for instance) as long as each of their RemoteIPRange configurations are unique. You could also have the same RemoteIPRange configuration on multiple Receive Connectors if your port or listening IP are different; and so on. With this configuration, if an inbound connection on port 25 destined for 192.168.1.10 is created from 192.168.1.55, then ApplicationRelayConnector would be used and it’s settings would be applicable. If an inbound connection to 192.168.1.10:25 came from 192.168.1.200 then Default Receive Connector would instead be used. The below image was taken from the “Troubleshooting Transport” chapter of the Exchange Server Troubleshooting Companion, an eBook co-authored by Paul Cunningham and myself. It’s a great visual aid for understanding which Receive Connector will accept which connection from a given remote IP address. 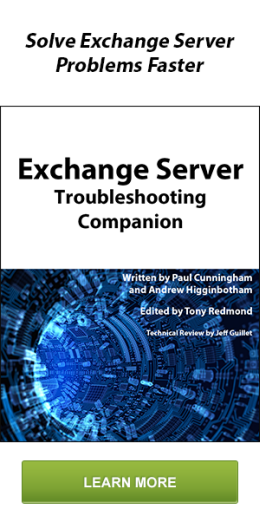 The chapter also contains great tips for troubleshooting connectors, mail flow, and Exchange in general. So in my customer’s specific scenario, instead of defining individual IP addresses on their custom application relay receive connector, they instead defined the entire internal IP subnet (192.168.1.0/24). This resulted in not only the internal devices needing to relay hitting the custom application relay connector, but also the Exchange Server itself and the Lync server also hitting the custom application relay connector; thus breaking Exchange Server Authentication. As a best practice, you should always use individual IP addresses when configuring custom application relay connectors, so that you do not inadvertently break other Exchange communications. If this customer had multiple Exchange Servers, this change would have also broken Exchange server-to-server port 25 communications. Over the span of the last 3 weeks, I’ve encountered five different customers experiencing this issue. Through my own lab testing and working with Microsoft Premier Support, we were able to diagnose the issue as being related to a recent Windows Update that was installed on the customers’ Windows Server 2012 Domain Controllers that introduced authentication issues. Outlook users in Exchange environments experience repeated authentication prompts when attempting to access their mailbox. OWA and ActiveSync were not affected by this “login prompt loop.” The issue began presenting itself after Windows Updates were applied to the Domain Controllers in the environment. Another symptom experienced in some customer environments were authentication issues when accessing Terminal Services/Remote Desktop Services. In testing, I actually found the authentication loop began when the Outlook client attempted to authenticate to the AutoDiscover service. From the client machine, I decided to test the authentication process by using Internet Explorer to browse to https://AutoDiscover.Contoso.com/AutoDiscover/AutoDiscover.xml. After initially authenticating, I was presented with repeated login prompts; the same symptoms seen in the Outlook clients. At one point I was curious to see if the issue was related to Windows/Kerberos authentication, so I decided to disable all authentication methods on the AutoDiscover virtual directory except for Basic. After doing this, I was able to successfully authenticate to AutoDiscover. Since this issue was affecting both the AutoDiscover and RPC virtual directories, it made me think it wasn’t necessarily Exchange that was broken, but AD authentication itself. We first looked at recent Windows Updates on the Exchange servers themselves, but saw nothing unusual. Even as a precautionary measure we removed the Windows Updates that were recently installed on the Exchange Servers the previous day, but the issue remained. We then noticed some recently installed updates on the Domain Controllers which were related to authentication. After removing all updates installed the previous day, the issue was resolved and the authentication loops were gone. We then spent time (via process of elimination) trying to determine which update was the culprit. -Have KB3175024 installed but DO NOT have KB3177108 (released back in August) installed. Obviously one possible resolution in my case is to install KB3177108 (which immediately resolved my RDP and Exchange login issues). However, I was curious as to why KB3177108 was not installed on multiple customers’ environments. After working with Microsoft, it appears that it was either because there was an issue initially installing KB3177108, or some customers chose to not install it for possible incompatibility reasons. Ultimately, the reason we encountered these issues was because the KB3175024 update builds on dependencies of KB3177108, but will install anyways (in error) if it is not present; resulting in the issue above. In short, KB3175024 makes changes that assumes KB3177108 is present. It installs even if KB3177108 is not present and causes authentication issues. Microsoft has released the below KB to address this issue. This issue occurs because a recent update rollup missed a dependency in updating Netlogon.dll. To resolve this error I needed to resort to using a long lost tool from the days of old, the IIS 6 Resource Kit. Note: This blog post could also be relevant if the OWA (or any other) vDir needed to be recreated and you encountered the same error upon recreation. Back in the days of Exchange 2003, the IIS Resource Kit, or more specifically the Metabase Explorer, could be used when recreating a Virtual Directory. Fortunately, the Metabase Explorer tool still works with IIS 8. So if a vDir is missing in IIS but present in AD, you’ll likely need to first remove it using the Remove-*VirtualDirectory Cmdlet otherwise it will generate an error stating it already exists. 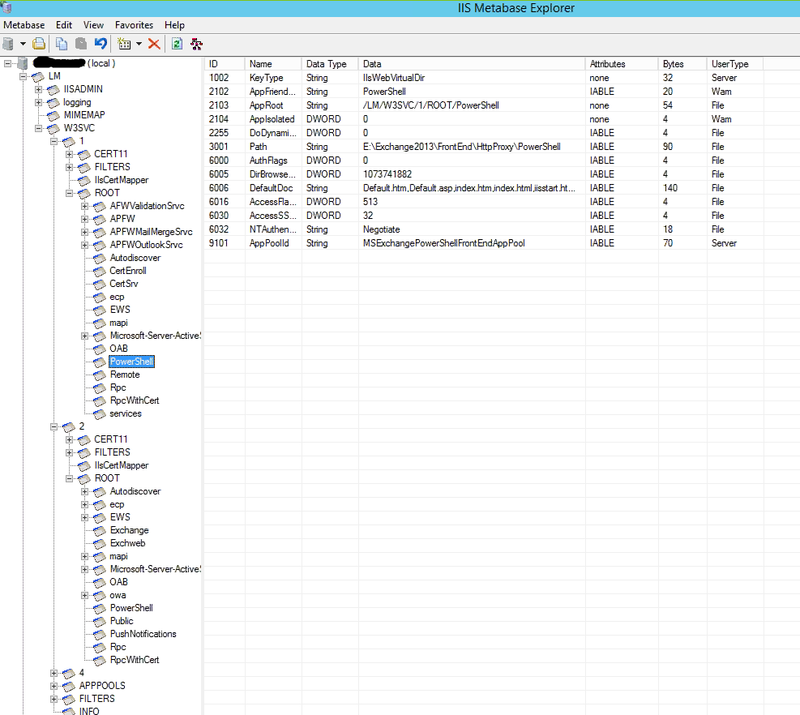 In my customer’s scenario, I had to do this beforehand as the OWA vDir was present in AD but missing in IIS. This brought us to the state we were in at the beginning of this post; receiving the above error message. The OWA vDir was no longer present in AD nor in the Default Web Site, but when trying to recreate it using New-OwaVirtualDirectory we received the above error message. 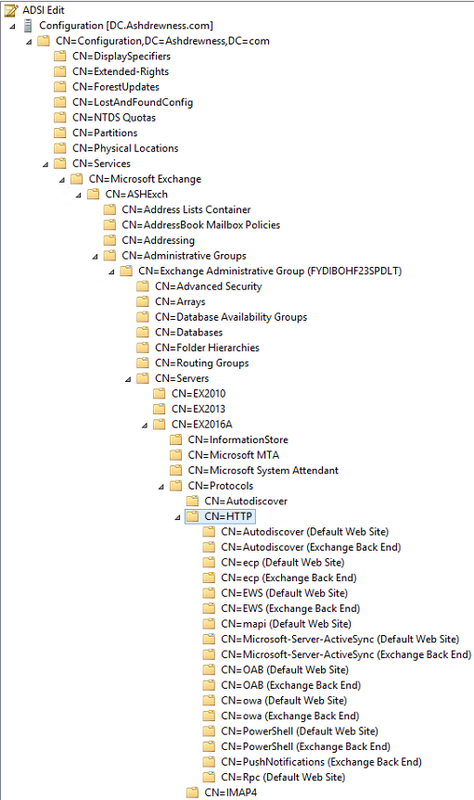 The solution was to install the IIS 6 Resource Kit and use Metabase Explorer to delete the ghosted vDir. When installing the Resource Kit, select Custom Install and then uncheck all features except for Metabase Explorer 1.6 and proceed with the installation. Once it finishes, it may require you add the .NET Framework 3.5 Feature. When you open the tool on the Exchange Server in question, navigate to the below tree structure and delete the old OWA Virtual Directory by right-clicking it and selecting Delete. When completed, the OWA vDir should no longer be present (as seen below). You should now be able to successfully execute the New-OwaVirtualDirectory Cmdlet. It’s always a bit nostalgic seeing a tool of days gone by still able to save the day. I’d like to thank my co-worker John Dixon for help with this post. When I can’t figure something out in Exchange/IIS (or anything really) he’s who I lean on for help.